Here’s why SBI Small Cap Fund should be on your bucket list. Aggressive investors looking for lucrative long-term investment opportunities to generate superior return must park their money in small-cap funds. Now, the question is which is the best scheme for investment? To answer this, one must analyze past performance, growth potential, own risk appetite, investment philosophy, and other key aspects. Under the category, there are multiple schemes which have outpaced their respective benchmark; S&P BSE Small Cap, still, the selection of the best scheme varies from investor to investor due to difference in choices. 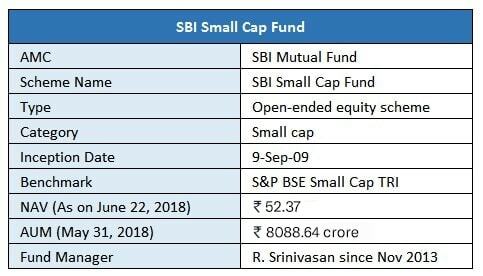 Long-term aggressive investors looking for a perfect blend of the value and growth-style of investing under the small-cap category must choose “SBI Small Cap Fund”. It is an open-ended equity scheme that exclusively invests in a well-diversified basket of small-cap stocks for long-term capital appreciation. In October 2015, due to the capacity constraint of Rs. 750 crore subscription in the scheme, it has been suspended. But now, on May 16, 2018, the scheme has been reopened for fresh investments. What Has Made the Scheme a Stellar Performer? Stock selection based on strong conviction after evaluation of the five crucial parameters including competitive benefits, return on capital employed, management quality, potential growth, and valuation have made the scheme a stellar performer under the category. As of May 31, 2018, the scheme has nearly 17% investment in mid-cap stocks, 38% investment in small cap stocks, and 35% in micro-cap stocks. Its portfolio is extremely biased towards engineering, financial, manufacturing, FMCG, and service sector with 20.02%, 13.64%, 8.62%, 7.78%, and 7.64% allocation, respectively. Srinivasan follows the bottom-up stock picking approach to determine the best stocks within small-cap space. Currently, Westlife Holding has the largest exposure of 5.86% that returned 54.66% return in last 1 year. Other top holdings include Kirloskar Oil Engines, Hawkins cookers, Alembic, Disa India, and LT Foods. Strong research enabled the scheme to beat its corresponding benchmark and category with a good margin. In the last 3-years and 5-years, the scheme has returned an annualized return of 20.33% and 34.49% outpaced benchmark by 5% & 12% and category by 7% & 9%, respectively. Historical results are clearly evident that the scheme has exceeded investors' exceptions by rewarding them extraordinarily. The fund has gained the most during the bull phases and also managed downfall well during the bear phases. In context to SIP, investors who started SIP of Rs. 10,000/month 5-years ago would have been able to accumulate Rs. 13,23,829 at an annualized return of 25%. In the same duration, lumpsum investment of Rs. 10,000 would have been grown to Rs. 46,789. Such whooping returns have made this scheme earn 5-star rating. The fund belongs to moderately higher risk grade. In the past 5-years, the scheme has a standard deviation of 18.48% little bit greater than its benchmark. Its beta coefficient is 0.84 while high Sharpe (risk-to-reward) ratio helped the scheme to generate outsized gains. In the last 5-yrs, the scheme has recorded highest drawdown of 16.89% which is a little bit above the benchmark's drawdown of 16.04%. It states that the scheme is subject to high market volatility, therefore aggressive investors with long-term investment horizon must go with the scheme to get an attractive reward. Earlier, the scheme was known as “SBI Small & Mid Cap Fund” but as per SEBI’s new mandate, the scheme has been renamed as “SBI Small Cap Fund,” thus leading it to fall in the small-cap category. It brings significant changes in the fundamental attributes of the scheme. As per the new rules, 251st onwards market cap companies are called as small-cap stocks whilst earlier, stocks beyond top 400 companies in terms of market capitalization were known as small-cap stocks. Thus, in line with the new categorization, the scheme has expanded its coverage to 150 more stocks. 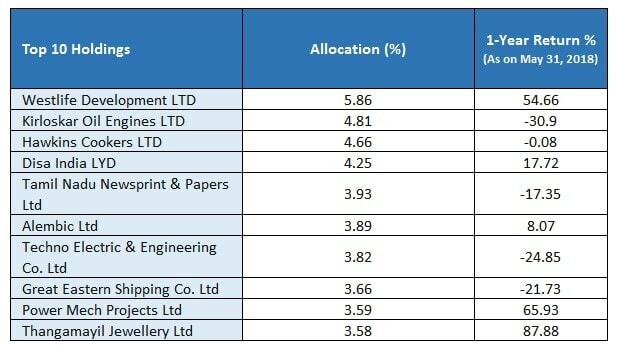 Before the re-categorization, the scheme has nearly 73% allocation in small-cap stocks which also fulfills the new categorization rule, as per which, small-cap funds are required to invest at least 65% in small-cap stocks. Thus, re-categorization did not bring any significant change in the portfolio, hence investors should not be worried. The new ones are recommended to invest their money in the scheme via SIP route for an investment horizon of at least 5 years. To begin your investment or seek guidance on the same, connect with us at MySIPonline through phone call or email.